Ocean Park Hong Kong is the largest marine-themed park in Southeast Asia and one of the biggest amusement parks in the world, covering an area of approximately 900,000 square meters. 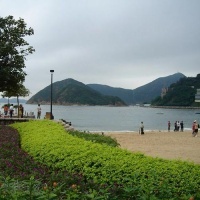 It is located on the southern part of Hong Kong Island, lying between Aberdeen and Repulse Bay. 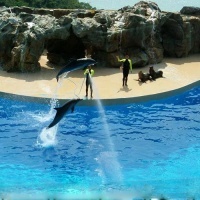 The Ocean Park Hong Kong consists of 7 lands, Amazing Asian Animals, Lowland Gardens, Whiskers Harbor, Tai Shue Wan Entrance, Marine Land, Headland Rides and Adventure Land. At the Amazing Asian Animals, visitors can see some rare animals around Asia, including the Giant Panda, Red Panda and Chinese alligators. The Goldfish display is available at the 'Goldfish Treasures' exhibit. Visit the colorful birds and playful Asian small-clawed otters at the 'Panda Village'. There's also the Panda Kingdom Shop for the perfect panda-inspired souvenirs and the Panda Cafe for relaxation and refreshments. At Lowland Garden, you can experience the fantastic voyage on the Ocean express, the latest quick, smooth, thrilling and fun way to travel from the Ocean Park Waterfront to the excitement at the Summit; or just take on the cable cars to the Headland and got a breath-taking and spectacular view of South China Sea and the surrounding area of the Ocean Park. The Ocean there at Marine Land is one of the top shows in the Ocean Park. In the Open-air theatre, the lively performances by dolphins, whales, sea lions and their trainers attracts throngs of visitors every day. The pool is large enough that sometimes can used to exhibit several large whales swimming and performing! Ride on the Dragon roller coaster at the Headland Rides, one of the longest rollers coasters in the world with lots of loops, twists and turns. The total length of the roller coaster track is approximately 830 meters at a height of approximately 20 meters. Don't miss the exciting thrill ride when you visit the park! 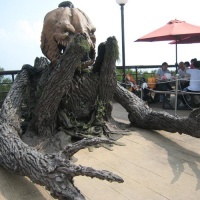 Other lands provide different exhibit and adventure experience, like the ride Abyss Turbo Drop, or take the outdoor Ocean Park Escalator to view the park scenery... Just visit the Ocean Park Hong Kong and reward pleasure and excitement experience. How to get there: Bus 629 from MTR Admiralty Station Exit B.